The past couple of weeks the weather has turned out really nice for us up here in North Wales. The temperature has gone up into it's 20's and it's definitely warmer than it has been for months. Although no one should complain about the heat, it is pretty hard not to complain if you are carrying a little one in your stomach. Carrying a baby makes you hot anyway, so never mind adding extra heat on top of that. The hot weather can make pregnant women feel light headed, dizzy and a little too hot. 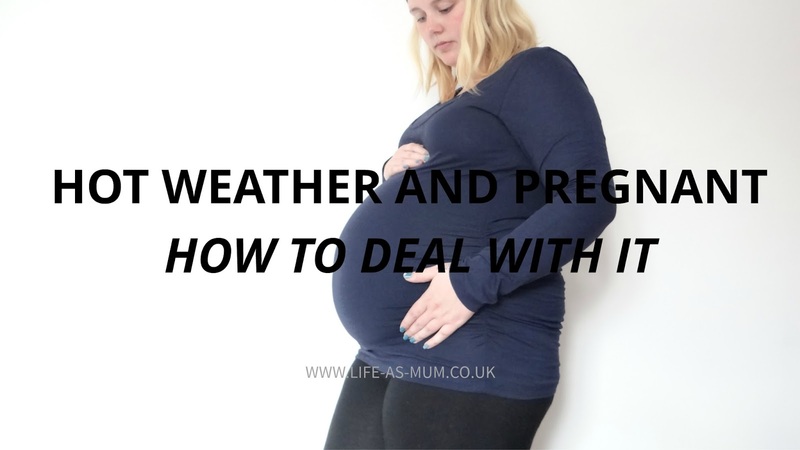 But there are ways to deal with heat whilst pregnant. If the temperature is really hot outside, it may be best to stay indoors with the windows open until it cools down a little. This is if you really can not deal with the heat. If you do go outdoors, try and stay cool in the shade instead of right in the sun. When the temperature is rising, it is important that you wear the right clothing. Try not to wear any tight clothing that may get you really hot. You could also try bright and light colours instead of dark colours, which may make you hotter. Wear short sleeves and vest tops with cropped leggings/trousers or skirts. A maxi dress could also be perfect in the heat. It is very important that you drink enough water/fluids when the temperature rises. You can get dehydrated much quicker in the heat, so make sure you drink the right amount of fluids each day. You could put your drink in the fridge to make it colder and so it can cool you down when you drink it. As well as wearing the right clothing for the heat, make sure your feet are getting as much air too. Flip flops and sandals are perfect for the hot weather and pregnant women. They are comfortable and very airy. How do/did you stay comfortable in this hot weather? I've literally just bought myself some more clothes, as I realised I only had jeans and leggings, and I don't think I could have survived till July wearing them! Don’t get this until you read my Old School New Body Review. Do you really think this ebook works or it is a scam? Free Workout Program Download! !